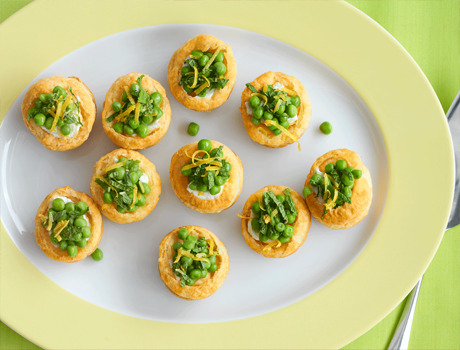 These irresistible tartlets feature baked puff pastry filled with a mixture of seasoned goat cheese and buttery petite peas. 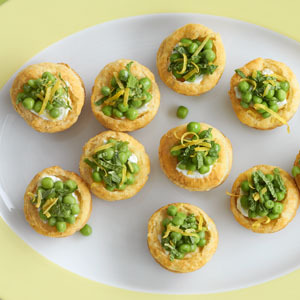 A sprinkle of fresh mint leaves and lemon zest and youve got a truly impressive appetizer! Heat the oven to 400°F. Grate 2 tablespoons zest from the lemon. Sprinkle the flour on the work surface. Unfold the pastry sheet on the work surface. Using a round cutter, cut the pastry sheet into 12 (2-inch) circles. Press the pastry circles into the bottoms and up the sides of 12 (2-inch) mini-muffin pan cups. Bake for 10 minutes or until the pastries are golden brown. Using the back of a spoon, press down the centers of the hot pastries to make an indentation. Let the pastries cool in the pan on a wire rack for 5 minutes. Remove the pastries from the pan. Stir the cheese, 1 teaspoon lemon zest and black pepper in a small bowl. Cook and drain the peas according to the package directions. Stir in the butter, salt and 1 teaspoon lemon zest. Spoon about 1 teaspoon cheese mixture into each pastry. Top each with about 1 tablespoon pea mixture. Sprinkle with the mint and remaining lemon zest. Season with additional salt and black pepper, if desired.